PAAP training in UgandaThe Global Acupuncture Project (GAP) is a pioneering initiative based in East Africa and Mexico that provides acupuncture training to local health care workers. 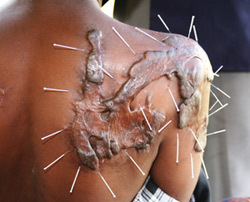 Since 2003 GAP has trained more than 150 health care workers to employ simple yet effective acupuncture techniques in the treatment of endemic conditions such as HIV/AIDS, malaria, malnutrition and tuberculosis. Those health care workers have in turn used their new skills to help thousands of Africans and Mexicans. The Boston-based Global Acupuncture Project is the culmination of nearly a decade-long quest to bring acupuncture to the people of the African continent and in Mexico who are struggling with HIV/AIDS. Since conducting the first training in Kampala, Uganda, in 2003, GAP, a registered NGO, has begun to realize the full potential of acupuncture on a continent where medical care is desperately limited. Today in Uganda, as a result of GAP’s efforts, acupuncture is employed in health centres and community clinics throughout the country. Due to a strategic partnership between GAP and the Global Outreach Program, PRC students can complete clinical training with GAP while bringing much needed expertise and support to the Project. The trainings usually last from 2 to 3 weeks, affording students the potential to gain 120 hours of unparalleled clinical experience. Acupuncturists and students from other colleges and are encouraged to contact PRC for more information on training opportunities with GAP. Academic credit may be available to you. Eligible PRC students must have completed the following prerequisites: a minimum of 200 hours clinical practice, OM201/202 TCM Diagnosis, and ACU113/114 Techniques and Therapeutics. Non-PRC students are also welcome to apply for acupuncture clinical placement. Please contact our Office of Admissions for more information and an application. GAP invites acupuncturists to participate in their next trainings. Please visit http://globalacupuncture.org/ for more information.